St. Tammany Linen Inc. has been taking care of linens for the finest hotels and restaurants in the New Orleans area for the past 25 years. Let us show you what a difference our attention to detail can make in your hotel. 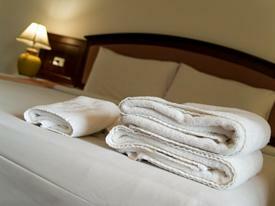 Having high quality linens that are cleaned and pressed are an important part of a hotels image. St. Tammany Linen Inc. will ensure that all of your hotel linens are cleaned and ready for even your most demanding clients. St. Tammany Linen Inc. provides full linen service for some of the most recognized hotels in the metro New Orleans area. Our linen service covers bed linens, towels as well as linens for your hotel owned restaurant or bar. Linens are picked up by our courteous and professional staff. Linens are plastic wrapped for protection from dirt and dust during shipping. Linens are delivered to your hotel facility on time!